A Laotian was sentenced to death on Thursday for killing two people and seriously injuring another by slashing their throats during a burglary in Samut Prakan. The Samut Prakan provincial court also ordered the convicted man, who goes by the single name of Phoula, to pay Bt2 million compensation to three members of the victims’ families. Phoula, 22, committed the brutal crimes in Samut Prakan province last year, despite the victims’ family having previously given him free food. Phoula confessed to having slashed one victim with a 40cm-long knife after she caught him red-handed during the break-in. Because her 12-year-old and nine-year-old granddaughters also witnessed his crimes, he attacked them too, killing the first and seriously injuring the other. 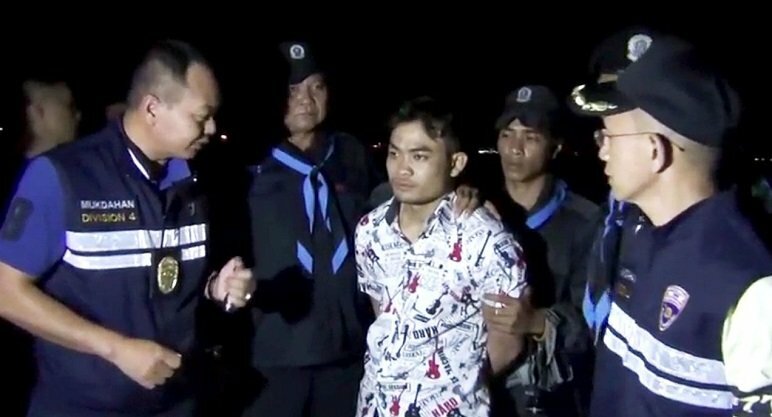 Following the crime, he fled to the border province of Mukdahan, apparently hoping to sneak back to his hometown. However, police arrested him before he managed to cross the border. The court said there were no grounds to commute Phoula’s death penalty, even though he had confessed to his horrific crimes. “The defendant committed brutal and inhuman crimes against an elderly woman and young girls, and thus poses a threat to innocent people,” the court concluded. You’ve been sentenced to death, and you have to pay 2 million baht. He better pay or he's in big trouble. It would seem unlikely that this psycho has 2 million baht anyway, but if he did and refused to pay, what would they do, sentence him to death twice? A pointless exercise. Let's hope they top the scumbag soon. Buying a Car inn Phuket - any good dealers?